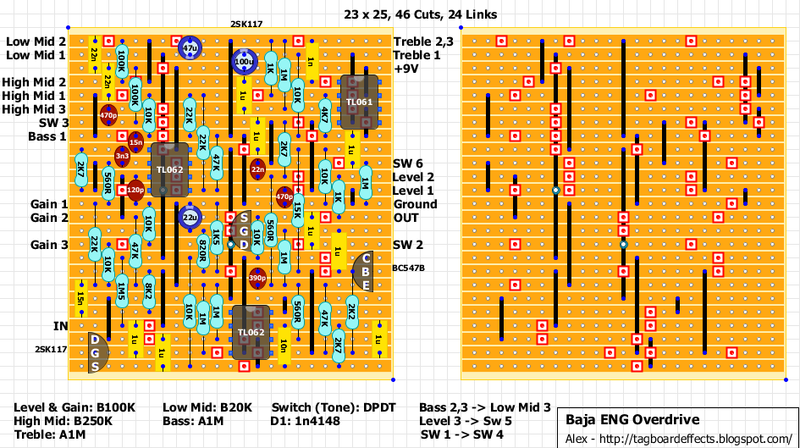 looks very interesting thanks Alex for these layouts. Building this one at the moment. I'll finish tonight I just need to get some 1u mkts from work. Looks good so far. The image of the transistor for the bc547 isn't the right way round for the bc547bs i have. It shows the emitter and bass legs are on the opposite side. Not that it should matter if you are checking your pinouts! Its the correct way round for rhe 2n5088/89s and bc550s i have if you are subbing the 547. I'll finish tonight and let you know how it goes! Emitter and collector legs sorry! I haven't got mine to work yet I just get oscillation.I've gone over it with a magnifying glass and can't find any obvious problems. I go over it with an audio probe tomorrow and see if i can figure it out. Pretty much the same as I got with mine. Trashed it in the end... I'd been over everything so many times that I reached a point where I stopped doubting myself and just 'effed it. Ops! Well spotted! I've fixed it. I just built this and it doesn't work. Even with the missing diode. 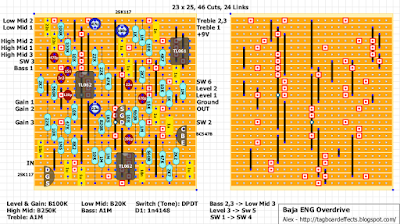 MDR and Engl schematics are different. No diode here. There were a few easily fixable mistakes in the layout. Compare the new layout with the old one. I've indicated which changes need to be made. I have built it and it sounds great! So, after that last update, and thank to Ryan Chappel, the layout is completely verified? Your reviews are serious business, man. What I like that you don't fool around and tell it like it is. By the way, can you recomnend an overdrive pedal to me? I heard this is good: https://bestazy.com/best-overdrive-pedals/ but I need your opinion.